le chaudron de vulcain – April 09 , 2019. EN. Peru : Sabancaya , Chile : Villarica , Chile : Nevados de Chillan , Kamchatka : Klyuchevskoy , Ecuador : Cotopaxi . Home / blog georges Vitton / April 09 , 2019. EN. Peru : Sabancaya , Chile : Villarica , Chile : Nevados de Chillan , Kamchatka : Klyuchevskoy , Ecuador : Cotopaxi . The columns of gas and eruptive ash reached a maximum height of about 3200 m above the crater. The dispersion of these materials occurred within a radius of about 20 km, mainly to the southeast and Southwest. Six thermal anomalies were recorded according to the MIROVA system, with values between 1 MW and 51 MW VRP (Rayed Volcano Energy). 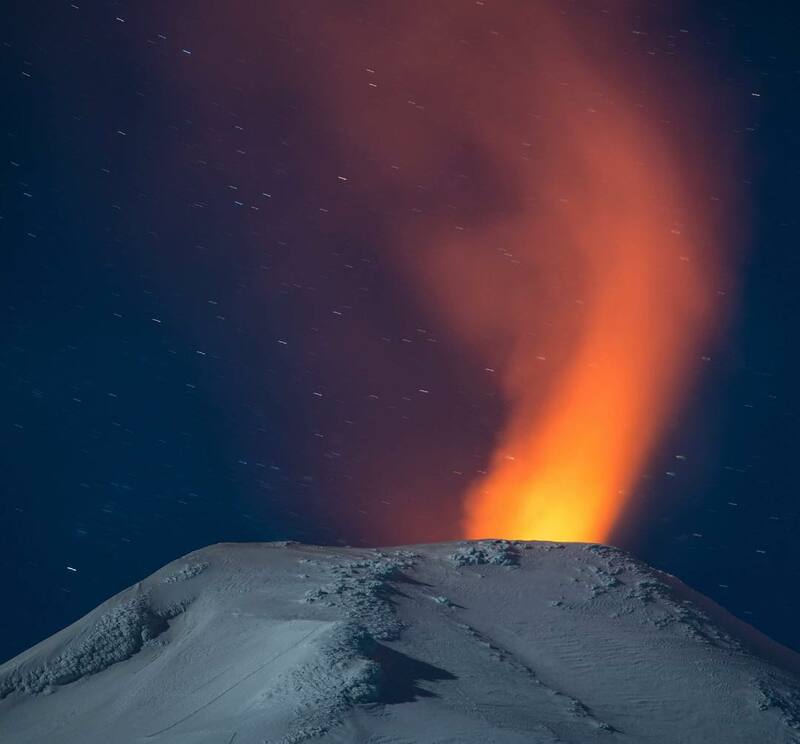 Eruptive activity maintains moderate levels. No significant changes are expected in the coming days. Photo : Martin Rietze ( mrietze.com). Increased frequency of Strombolian explosions reaching ballistic heights up to 50 m above crater rim. A possible change in the inclination of the upper chimney is observed. Lava splashes are now rushing to the east. 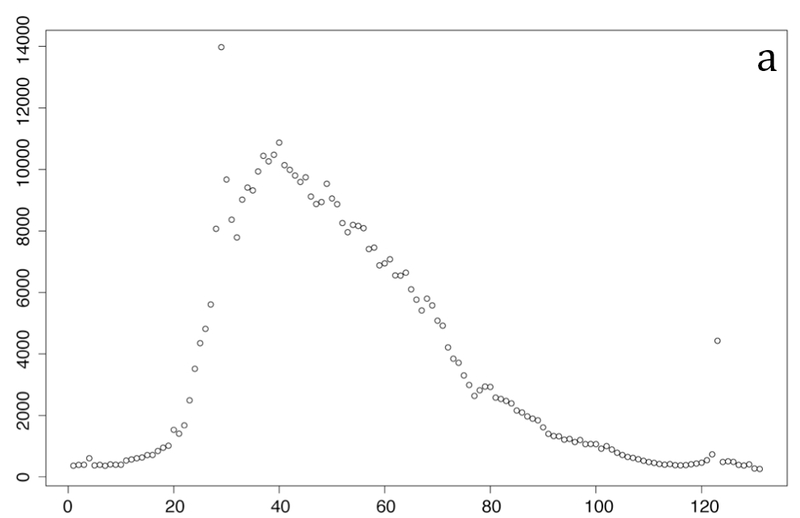 The seismic energy oscillates below average. 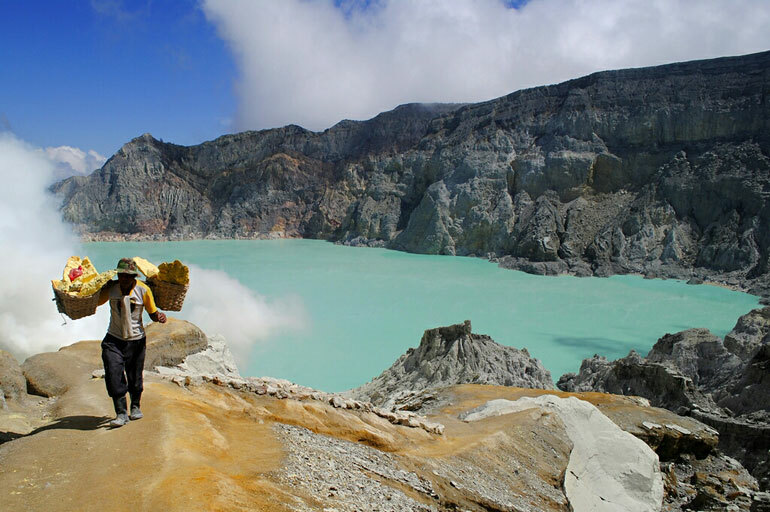 The geomorphology and heat of the surface at the bottom of the crater remained unchanged for 5 months. A total of 6,538 seismic events were recorded, of which 6,517 were classified as long-period type (LP) earthquakes, in relation to fluid dynamics within the volcano, with reduced maximum displacement values of 22 cm2. In addition, 21 volcano-tectonic (VT) seismic events were recorded associated with rock fracturing. The event with the greatest energy had a local magnitude of 2.5, and was located 4.4 km east-southeast of the active crater and at a depth of 4.0 km. The volcanic tremor signal, a seismic signal also associated with the dynamics of fluids within the volcano during the period considered, has been maintained with reduced displacement values of up to 3 cm2. 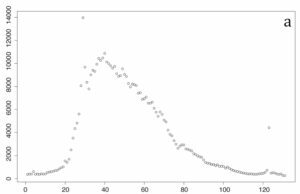 On the other hand, the dominant frequencies are maintained between 0.9 and 2.1 Hz. 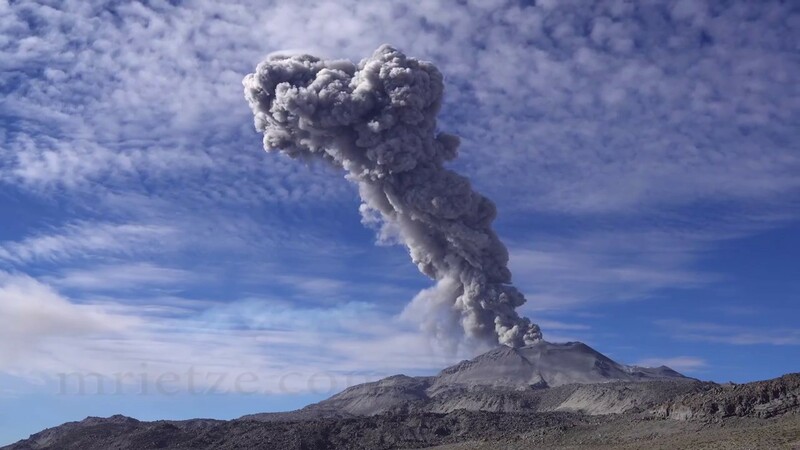 The images recorded with the IP cameras installed near the volcano, when the weather conditions allowed it, showed degassing of predominantly whitish color; this one did not exceed 150 m of height. In addition, a night glow is recorded, when the weather conditions allowed to observe it. 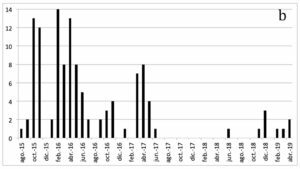 According to the data provided by 4 GNSS stations and two (2) electronic inclinometers, there is a variation in the vertical trend, contrary to the uplift described in earlier periods. In spite of this, it is concluded that the deformation of the volcanic edifice remains stable, with minor variations less than 0.5 cm / month. The elongation of the control line that crosses the volcano from the northwest to the southeast is maintained at not more than 0.2 cm / month. According to the data provided by the differential absorption optical spectrometry equipment (DOAS), Los Nevados and Tralco stations, located 10 km east-north-east and 6 km east-southeast of the crater active , sulfur dioxide emission values of 293 +/- 50 t / d were recorded, with a maximum value of 697 t / d reported on 02 March. These values are considered as usual for this volcano. 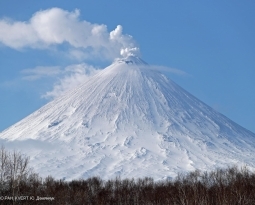 During the period, 2 thermal warnings were reported on the volcano, with a maximum observed volcanic radiative power (VRP) of 0.8 MW as of March 11, which is considered moderate, according to the data processed by Observation of volcanic activity (Mirova) (http://www.mirovaweb.it/). The activity related to fluid dynamics has increased during this period, however the volcanic system retains its equilibrium. It is noted that the dynamics of the lava lake located in the main crater of the volcano is fluctuating and that it continues to be located near the surface, moreover, with the changes shown by the components of the deformation monitoring system. the occurrence of minor explosions affecting the environment of the crater is not excluded. GREEN LEVEL: Active volcano with stable behavior – No immediate risk – Time for possible eruption: MONTH / YEARS. Observation: Due to the fluctuating dynamics of the lava lake, it is recommended to apply precautionary access restrictions to an area close to the crater with a radius of 500 m.
Source : POVI , Sernageomin. Photos : POVI ( Werner Keller ) , Auteur Inconnu. 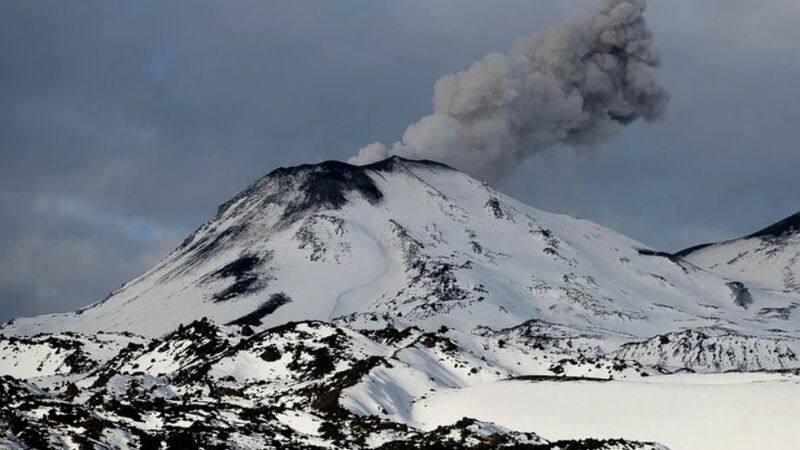 Nuble Region, Nevados Volcano of Chillan, 08 April 2019, 04:30 local time (mainland Chile). 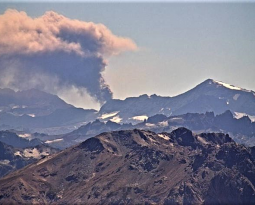 Yesterday, Monday 08 April 2019 at 04:03 local time (08:03 GMT), the monitoring stations installed near the Nevados volcano of Chillan recorded an explosion with a long period type (LP type) associated earthquake, which event of high energy has been located in the main crater. Activity of the volcano increased. 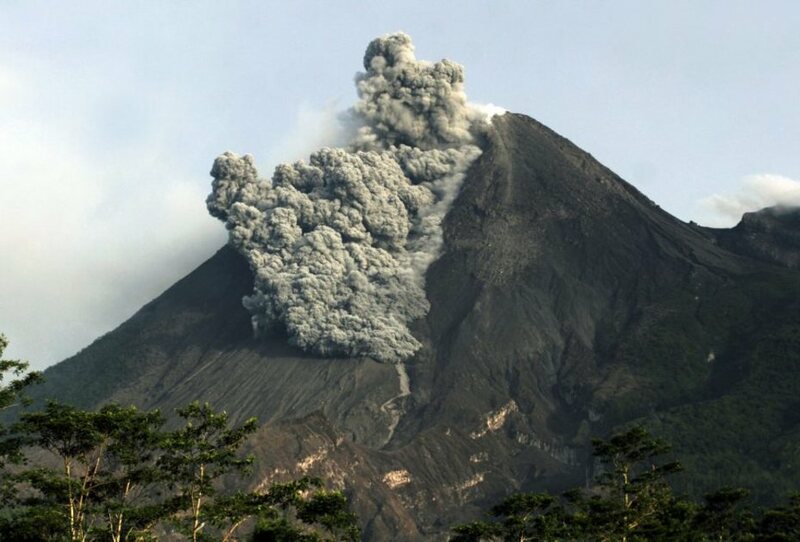 A small ash plume from the volcano began to observing from 22:30 UTC on 08 April. The volcano was obscured by clouds last week. A moderate activity of the volcano continues. Ash explosions up to 16,400-19,700 ft (5-6 km) a.s.l. could occur at any time. Ongoing activity could affect low-flying aircraft. New secondary lahar on the Cotopaxi volcano. On April 3, 2019, starting at 4:10 pm, the BNAS seismic station recorded a secondary lahar (Figure 1a) on the northwest flank of the Cotopaxi volcano. This event is one of 119 recorded in this ravine from August 2015 to date (Figure 1b) and is the fourth largest, with an approximate volume of 40,000 m3, a peak flow of 18-20 m3 / s and a duration of just over 120 minutes. 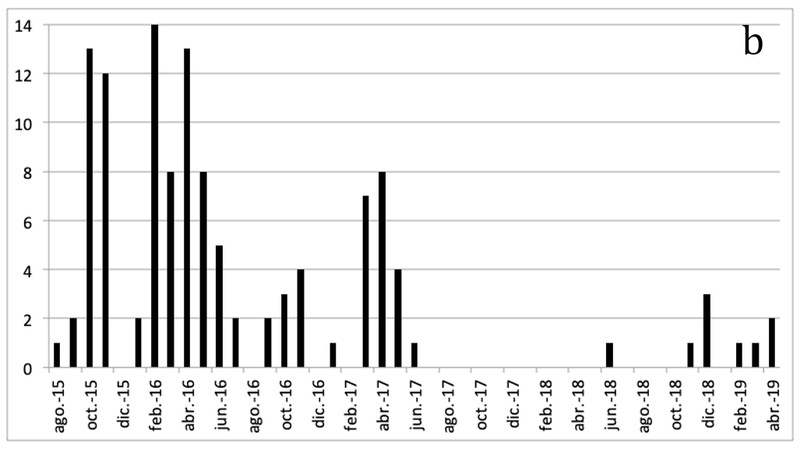 Figure 1. a) Seismic recording of the BNAS station showing the lahar hydrograph that occurred in Cutzualo-Agualando stream on April 3, 2019 at 16:10. b) the recurrence of secondary lahars recorded in the same stream from August 2015 to today. The lahar was the product of heavy rains that fell on the afternoon of April 3 in the area. 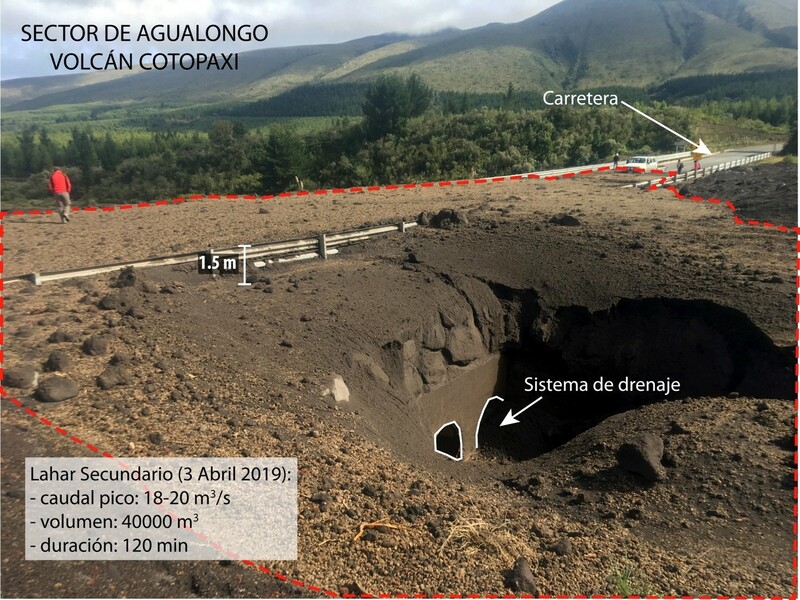 The stream descended through Cutzualo Creek to reach Agualongo Creek, collapsing its drainage and flooding a section of the road from the southern entrance of Cotopaxi National Park (PNC) to José Ribas Refuge (Figure 2). The lahar deposit is very rich in rocks of different sizes and has reached a maximum thickness of 1.5 meters on the road. He needed machines for his re-habilitation. Figure 2. Photograph of lahar deposits that occurred on April 3, 2019 in Cutzualo-Agualongo Creek. (Taken on April 4, 2019, E. Saltos – IGEPN). 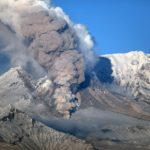 Étiquettes : Blog Georges Vitton, chili, Cotopaxi ., Equateur, Kamchatka, klyuchevskoy, Le chaudron de vulcain, Nevados de Chillan, perou, Sabancaya., Villarrica .